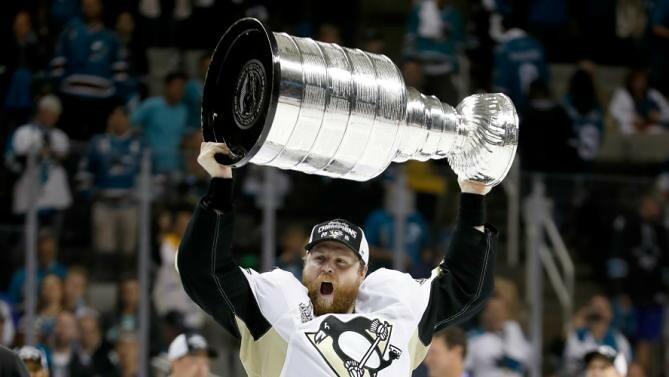 Phil Kessel and Larry Murphy walk into a Toronto bar............and sip from THE STANLEY CUP and laugh their asses off. Meanwhile the Leafs draft Terry Clancy Jr. and Todd Gill Jr, both from the Belleville Bulls, instead of Austin Mathews. If anyone has any regret about the Leafs trading him, know this: Kessel had 20 pts in his last 43 games as a Leaf and was a -27. Babcock and Shanahan were not going to put up with that. but he worked his rear end off in this series and deserves it along with Crosby and the rest of the Penguins, full team effort. Management is to blame for the way things went down with the Leafs for the last 20 years..Now they seem to have righted that ship..so here to the future! From worst to 1st in same year. Personally he was in a bad situation from day 1 in Toronto. Glad for him & Sid the Kid. How much longer will he be Sid the Kid?? It just goes to show you how a bad fit in one place is a good fit elsewhere. Phil didn't belong in Toronto and clearly was not happy. He now has a moment to cherish forever. phil's a great compliment player but not a core player. congrats to him but it still was the right decision for the Leafs to move him. I could care less about Kessel's cup. As Leaf fans, how are we not still lamenting not having Seguin and Hamilton? Their lack of being in the blue and white has more impact on this club than some former player being a champion on another team. Absolutely the correct move to trade Phil. I'm happy for the guy - he's on a team in the right role. Congrats Phil! I'm happy for him. It wasn't his fault he was part of an epic failure here. That lands on Burke and the rest of the management. And it's not his fault the team hasn't been to a final since I the spring before started kindergarten. that's on a whole bunch of other management people. I'm cautiously optimistic they are on the right track now with the total rebuild i thought they should have started in 1996 . I don't care what happened since 67 anymore I'm looking forward. So Tyler Seguin and Phil Kessel have Stanley Cups. The Leafs will never win a cup with Nazem Kadri as one of its core players.